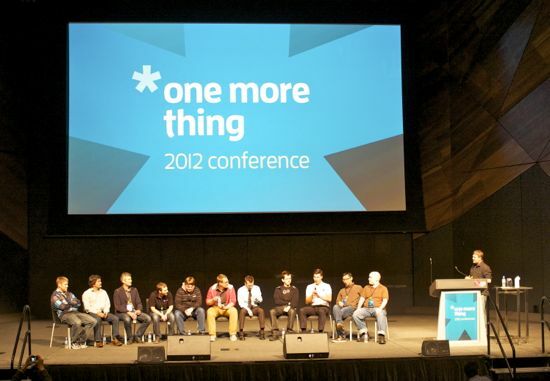 Today I've had the pleasure of attending the One more thing conference in Melbourne. I can't praise the organisers highly enough, the conference was well run, well designed and the speakers represented a galaxy of stars from the ranks of successful iOS developers around the globe including Flipboard, Tapatalk, ShipFinder, Pano, Trainyard, Calvetica, Doodle Jump, Elements and others. Much of the discussion was about gaming the App store and dealing with the inconsistent Apple review process. Clearly the store, while extremely successful, is broken in important ways. I came out of the day inspired, motivated and informed. Many of the developers gave valuable real data about their earnings, what worked and more valuably what didn't. 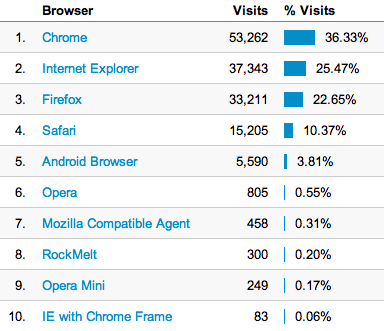 What's the most used browser? There's been a bit of controversy about claims this week that Google Chrome is now the most popular browser. According to stats to hand for a site I manage, it's been ahead for some time. Obviously it would be different for different sites but my evidence is pretty clear. A new toy, a PK Loop Antenna. 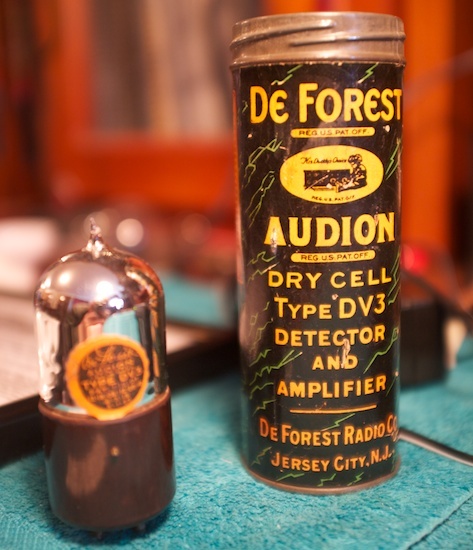 This one tunes from 6MHz to 18MHz, so it's designed for shortwave broadcast listening. Even indoors, amongst all sorts of electronic equipment, fluorescent lights and computers, it tunes up well and band noise can clearly be heard. 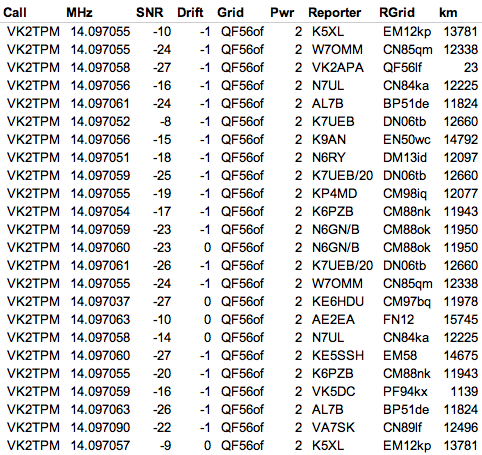 The best way to evaluate an antenna is by comparing with my normal outdoor wire dipole decoding WSPR signals on 20m. 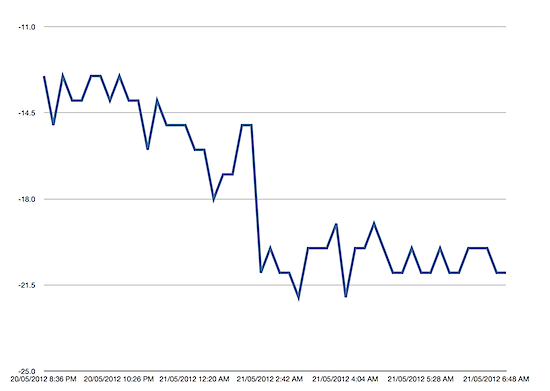 The big drop is where I switch from the outdoor dipole to the little indoor loop. This graph shows signal to noise ratio of my reception of VK2UX, a station I watch as he has wonderful low noise reception compared to mine. The amazing thing is not the drop in SNR but that I can still receive low power WSPR signals at all with this little indoor antenna. The loop is well constructed and seems to work remarkably well. I just have to remember not to transmit into it! If you access a recent (after unity) Ubuntu via remote desktop with VNC you'll have a lot of trouble with the screen not repainting. I'm accessing 12.04 but it happened in 11.10 as well. The fix is to log out, then in the login screen click the little ubuntu circle next to the user name and select "Unity 2D". Maybe when you enable remote desktop it should warn us about this? 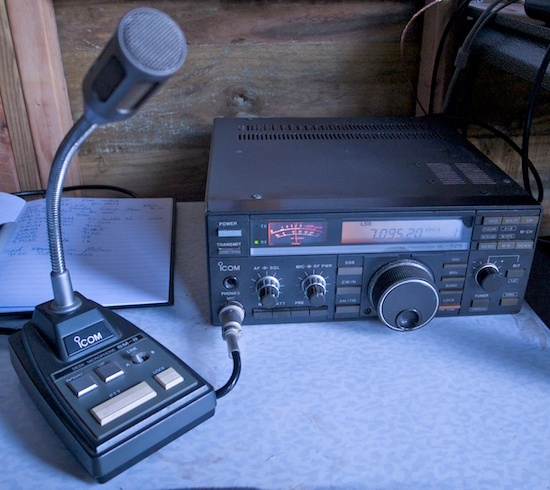 Recently I "traded down" from an IC-7000 to an IC-725. One thing I missed was DSP noise reduction. Mal, VK2BMS recommended a BHI NES10-2 MK3 speaker. Here's a demo, the best performance is after I stop talking by the way. It does seem to be better than the DSP built in to the IC-7000 and has the advantage that it will work with anything, including little home brew receivers. 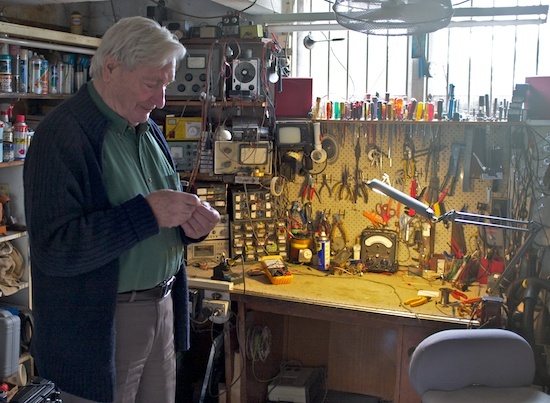 Through local ham, Robert, VK2ZNZ, I've had the privilege to meet Jack Meijer who restores and more amazingly builds valve radios. Jack has a wonderful workshop in the garage. 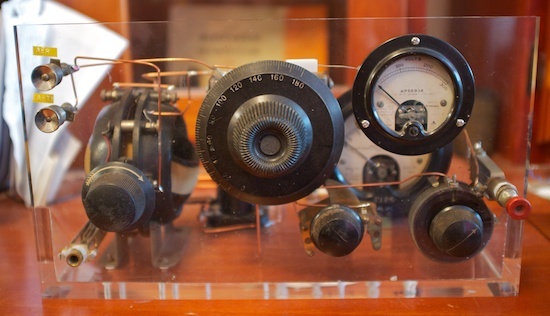 The radios he builds are often in perspex so you can see the interesting components such as the variable coupled inductor on the left in this regenerative receiver. Jack is 87 and while he has a few physical complaints he's clearly very healthy, alert and doesn't even need glasses! 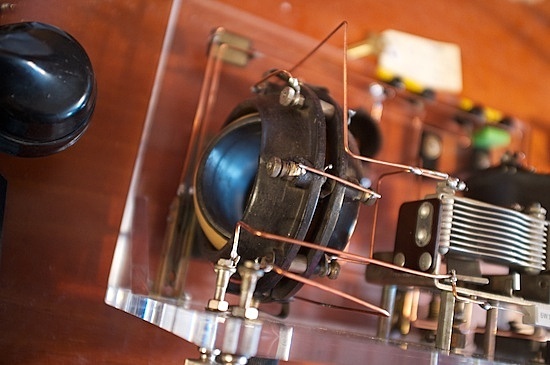 The list of patents show that these valves had a very long life span as the current technology. 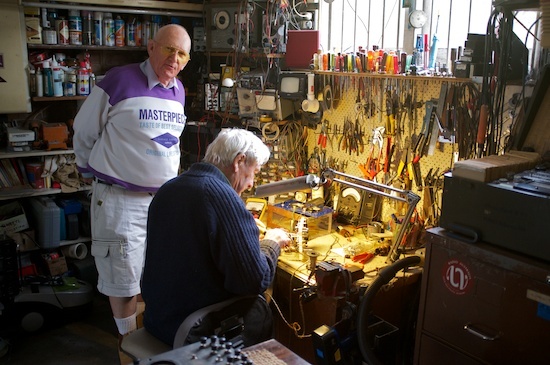 Jack constructs really beautiful equipment, the last time I saw wiring like this was in the 80s when I had the pleasure of working with Wally Chaimberlan at 3DB. Note: I previously mis-spelt Jack's surname - sorry about that. 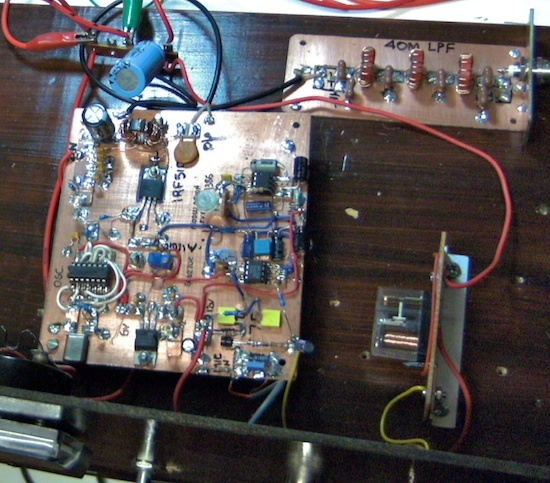 It's great to see a few people working on the latest ARNSW Home Brew group "challenge" project - to build a 40m AM transmitter. 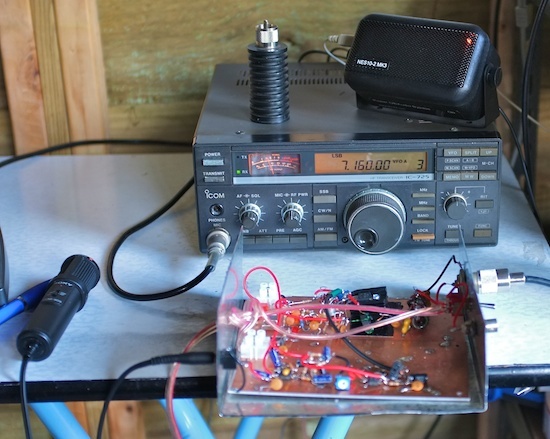 I'm on the way, but my design only puts out 2W, but Stephen, VK2BLQ is running his IRF510 on 24V and getting 5W or more. His design features a beautifully stained breadboard base to give the machine "soul". 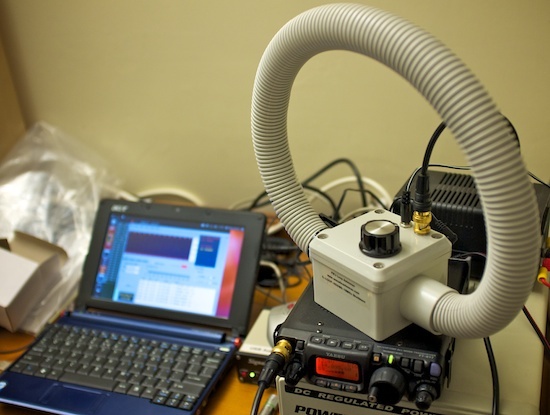 I was able to receive Stephen readability about 3 and we coordinated on 2m (on my old favourite channel "D", 147.475MHz) to get things set up. Unfortunately, he couldn't hear my transmission but just look at the wreck of a rig I was using (the one in the foreground). One thing that has worked out pretty well is the piece of aluminium I bent into the simple "U" shaped chassis you see above. Incidentally, the $220 IC-725 is going well. I replaced the right hand dial lamp with a 12V yellow LED. It's not as bright as the light on the left (that hasn't blown) so I might replace it too to balance things up. The band noise on sideband sounded very different between upper and lower and I've now adjusted the BFO on the upper side to bring them in to line (that's the one that sounded out of kilter). This was purely done by ear but it seems to have done the trick. Keen eyed viewers will note a new addition to the shack - a BHI NES10-2 MK3 Noise Eliminating Speaker. So far I'm very impressed and will post a review shortly with a demo. Yahoo doesn't seem to know which way is the past and which is the future, I think whoever is in charge should be sacked, oh, he just has. Amazing. Minimum distance, 11,824km away, up to 15,745km. Gotta love WSPR. Interesting, it must take a little time for reports to trickle in, there's a few more for the first transmission and then reports on a second. At this point I've only heard 5 stations so clearly my reception is no where near as good as other stations'. Incidentally, this is running on an Acer Aspire One netbook with an Atom processor running Ubuntu 12.04. The mood amongst manufacturers I chatted with was pretty negative. The combination of our high dollar, competition from Asia, and the uncertainty of the looming carbon tax is not enough to counteract growing opportunities to supply the booming mining sector. Defence was once seen as a marvellous new market for manufacturers but cuts in recent years, (and no doubt in tonight's federal budget), have hurt this sector. One speaker commented that it's not wise to bet your business on government work as government is "not rational". The car industry continues to shrink and car parts suppliers will be rationalised. The move towards global car platforms will either provide opportunities for us to supply globally or conversely cut us out of even local supply. Mining continues to grow and requires 15% per year more manufacturing supplies of which we get an additional 5%. Wages in China are starting to rise, and it's not just at Foxconn, so there is hope that we can compete provided that we invest in new technology and automation. Computer controlled milling and cutting is everywhere and general purpose robots are so cheap that they can pay for themselves in a year even doing things like packing biscuits. Additive Manufacturing (3D printing) is getting cheap, with one machine on sale for $1,600 that seemed useful for prototyping at least. One positive of the carbon tax is that in a carbon constrained and priced world, transport will be more expensive and this will favour local manufacturing. 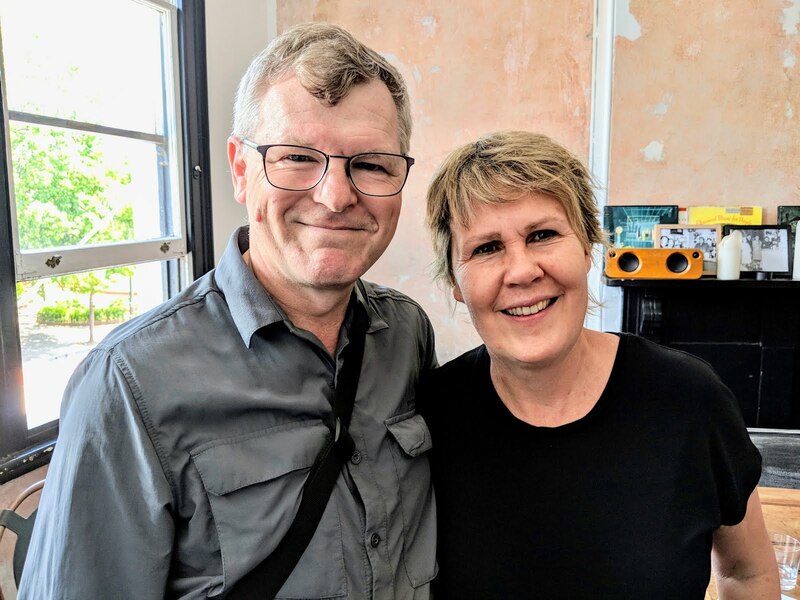 While there are some local success stories including Resmed, Cochlear, and AussieBum, the majority of product design is done outside Australia and until that changes we will find it hard to compete. The Epson robot guy I spoke to (there's a bit in the video above) said that they've just had their best year on record selling robots in the US. 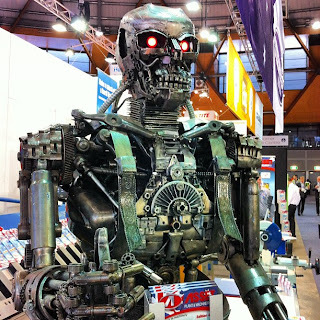 If we could come up with ways to apply robots to health care we'd be on a winner. A $30 DVB-T USB stick just arrived from China and coupled with HDSDR and helpful instructions I'm starting to tune around and hear signals. The first thing I tried was 123MHz AM, air band. Still lots to learn but this is an encouraging start. These dongles can tune over a wide range, some from 64MHz to 1.7GHz. Here's a stronger FM signal. There is a list of compatible devices and an active discussion in a subreddit. Notes for myself (and Ross, VK1UN etc). 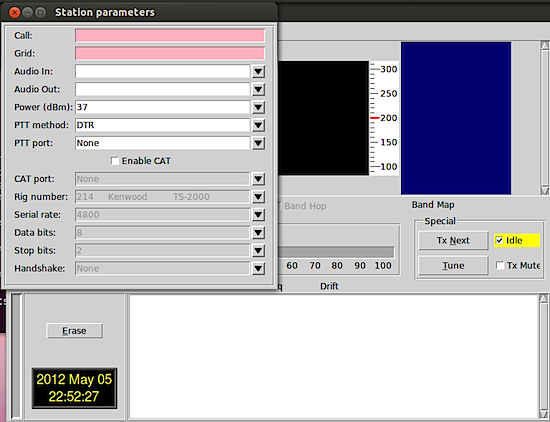 How to build WSPR on a fresh Ubuntu 12.04 desktop. Using gfortran as fortran compiler. So, it's actually getting easier in that more of the dependencies are already installed by default. The only tricky bit was figuring out where the portaudio libs live now. 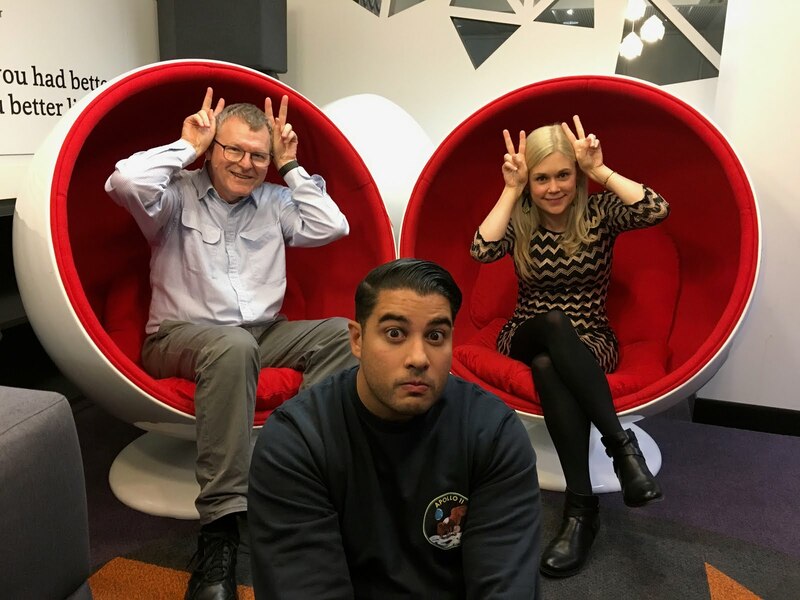 Regular readers will know that I'm a huge fan of ABC Radio National and it's a privilege to contribute technology commentary to RN Breakfast in recent years and lately Marc Fennell's (probably ironically) titled radio program titled "Download this show". 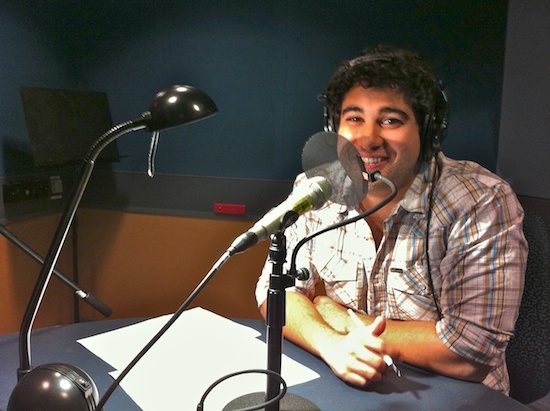 Marc is a multi-talented producer, author, editor, and presenter on both TV and audio. This week we talk about exercise apps (some with zombies), cloud disks, and the price of software in Australia. 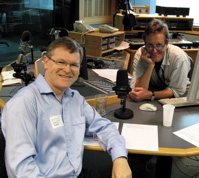 You can hear "Download this show" on RN on Sunday at 9:30pm or download the show now via the podcast feed. 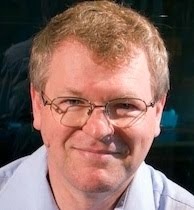 I'm looking forward to National Manufacturing week and will be attending on Tuesday and probably talking about it on RN Breakfast on Wednesday. Listening to RN makes me smarter. 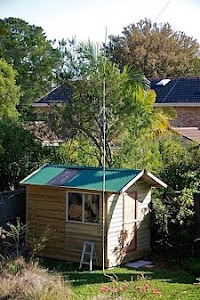 Just had good reports for my first contact with a new rig in the shack. The Icom IC-725 was spotted on eBay last week and I was the only bidder at $220 which I think is a pretty good deal. The transceiver has a few minor issues: half the dial light is out, it's a little off frequency and there's a bit of corrosion here and there. After a little cleaning up I got on air on the Kandos net, VK2ARK, hosted by Tom, at 4pm eastern time. It's a friendly and lively net and they've been kind enough to respond to my calls on a QRP rig in the past. I got good reports including one from Mildura almost 1,000km away. 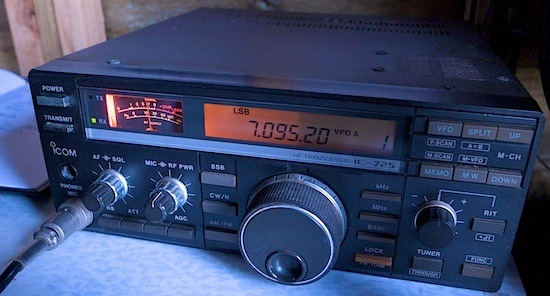 The IC-725 seems like a good entry level older rig. Although it doesn't have any bells and whistles like DSP or different filters, the AGC has two time constant settings (much better than the still in production IC-718 that has only super-fast AGC). 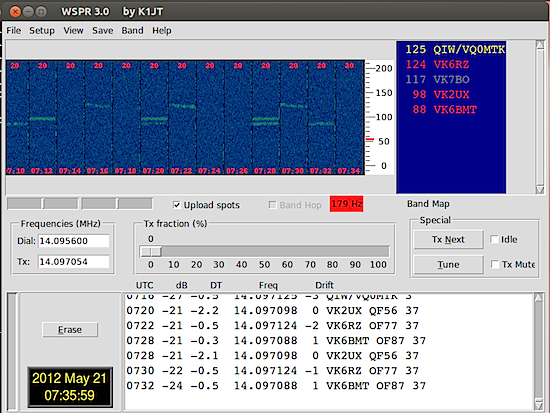 I've opened it up and moved it pretty much on to frequency (by ear using the 3.699 VK2WI beacon). 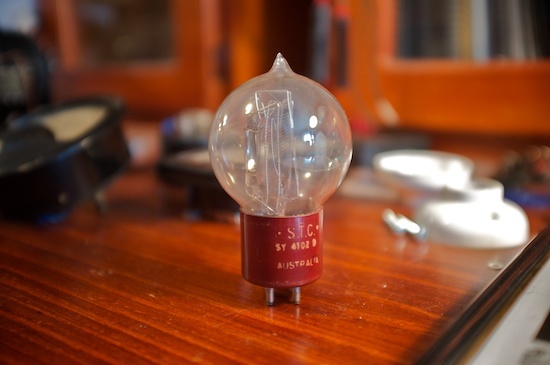 The dead dial lamp has been removed - it's a tiny 12V incandescent lamp. 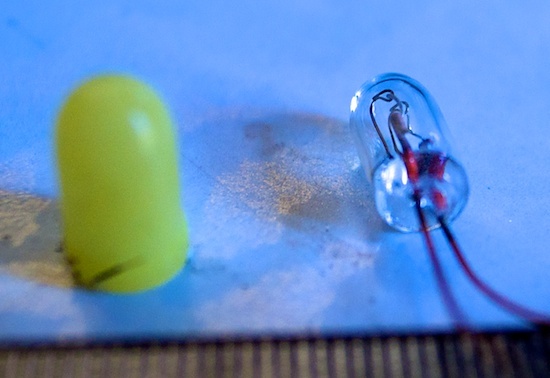 The hole is too small for any of the LEDs I have laying about. The lamp is inside a yellow rubber holder. Those ruler gradations are half millimeters, it's pretty small.